The installation will take place before the shop opens, collectors wishing to visit on that date should note the Kiosk is scheduled to be available from 10:00 am. It should be noted that entrance to the shop is free." I've no idea what this means! 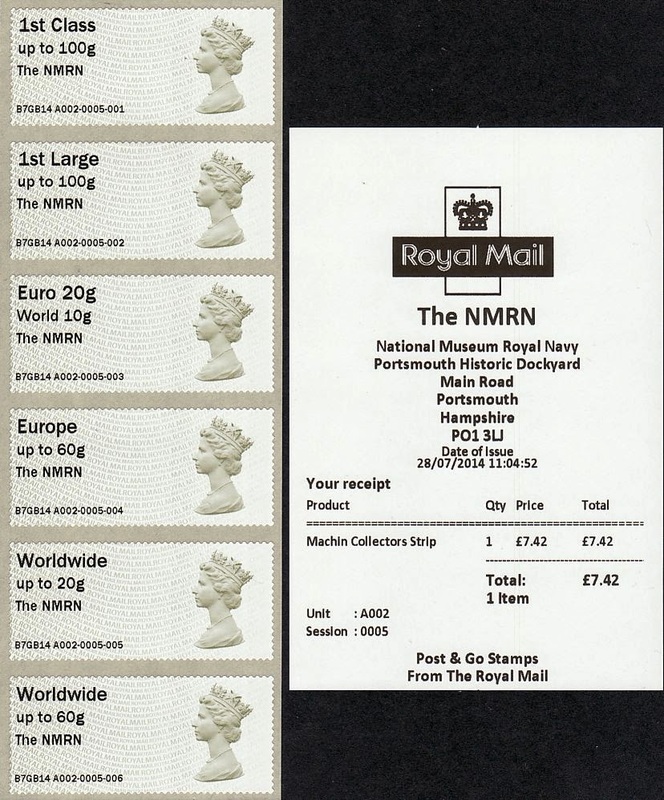 Following the introduction of the dual value design in April and subsequent feedback from collectors, the font used on Royal Mail Post and Go machines will change to help improve the overall look of the stamps. The first use of the new font will be at the National Museum of the Royal Navy in Portsmouth from 28 July 2014. 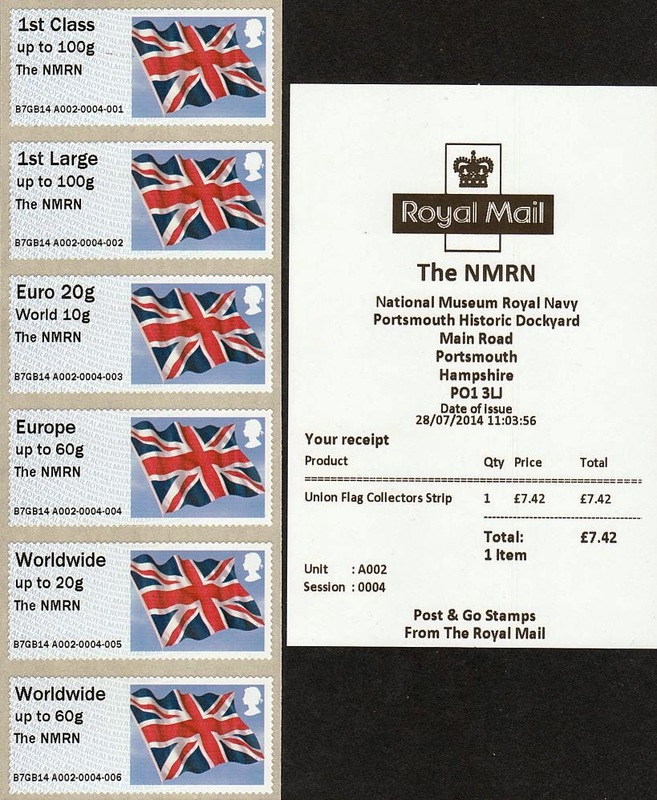 Following on from the success of the static Post and Go machine at the BPMA in London, Royal Mail will be installing its second static Post and Go machine at the Royal Navy Museum in Portsmouth from 28 July 2014. Machine A002 will initially carry Union Flag and Machin designs with the static location identifier ‘The NMRN’. The machine will be located in the Museum shop. For some reason Royal Mail have decided that the best place to put news about Post and Go is on EVERY Post and Go product page in their web shop including album pages! See here. Thank you to dealers and collectors who visited Portsmouth and made reports, some as emails some as comments. This update incorporates both sources. It is actually in the 'Babcock Galleries' which is part of the Museum itself which you need a ticket for and were initially challenged for. However, having spoken to staff and the ticket office at the main gate to the Dockyard, access to use the Post & Go Machine is now FREE. Machine was up and running at 11 am after some technical hiccups. I'm not sure where the last blog contributor thought he was today but having attended myself then the machine is in the shop accessed following signs for the Museum (there were books, models, etc there to buy right alongside the machine with a sales/cashier lady in attendance. I arrived about 12.50 (my eventual receipt was timed at 13.01). I asked from the point of entry where the museum was because I wanted to use the new stamp machine; all 3 'assistants' I spoke to knew exactly where it was and guided me appropriately (and no-one asked me to buy a ticket). Yes, after following the well-displayed signs and entering through the only door marked for the Museum you have to pass along through the B. gallery, but then there is this little shop layout with stamp machine at the end before the (seemingly only!) public exit with things for people to buy. Anyway, mere detail. The important thing was that the machine was up and running and only one other person wanting to use it (a dealer who very graciously allowed me to get the 2 x collectors sets of each + a strip of 6 x 1st of each in-between his transactions). I would have to admit though, that I don't see what use the machine is going to get other than from collectors when varieties, etc change. I certainly don't remember any signs highlighting the availability of stamps to 'ordinary' visitors (and there is no post box, let alone any link with the permanent Portsmouth (Mary Rose) cancel - good marketing could link all this together for the public). But hey ho! I also went to Portsmouth on the first day for this issue and the machine appeared to be in a shop as there was a counter with till and lots of books, DVDs and souvenirs for sale. I got there at about 11.30 so maybe it was moved after I left. I was not asked for a ticket at either the main gate or the entrance to the Museum shop but just directed to the shop. The stamps look quite good with the new bolder font and more in line with the current NCR stamps. Certainly an improvement on the previous font which is still in use at the BPMA until August. Stock of both Machin and Union Flag stamps is undated. See foot of this report for pictures of both stamps and receipts. So thanks to all reporters for confirming that the machine is available, though as Mike mentions, there is little publicity there, and no marketing. What is the point, apart from attracting collectors. Now the collectors may spend some time in the museum as well, but that can't be the motivation behind this idea. The BPMA I can understand; this one I can't. Previous BPMA layout, and (below) stamp produced at York. 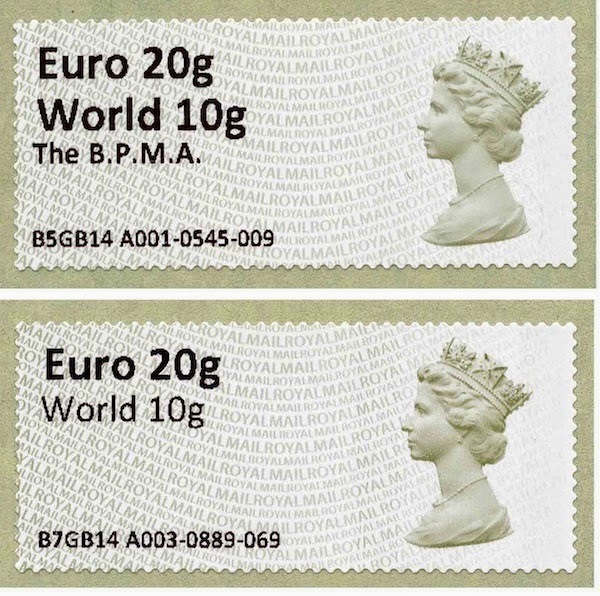 Most noticeable is the rounder figure 0, the curved serif on the figure 1 in 10g, and the serif on the g. Brian has mentioned that BPMA will be changed in August with the introduction of the Airmail slogan, and it remains to be seen whether the peripatetic machine A003 will be changed before its appearance at PhilaKorea or Stampex. Summary of earlier report, referred to above. But JG has pointed out that this is not be the first instance of the revised (non-bold) font for the 'World 10g' caption on the RM2 machines, as this was used at York on 18/19 July. Here are pictures of the BPMA original version and the one used at York. (The Union Flag* was also available.) We expect the Portsmouth printing to be the same as York but with the addition of The NMRN. This was automatically uploaded overnight to the machine rather than going through a manual check which would have held it. We will be introducing a ‘Go/No Go’ option before similar updates go live. So we are happy for the customers who pre-ordered these stamps, but have no stocks for sale at this point. So collectors want yet another font change do they? Whoopee, can't wait! Sorry i may be one of those to blame, i did give feedback saying that i thought the World 10g was too big. Any idea if the NCR machines are changing font or spacing between? Just clicked onto your link to the Royal Mail page and discovered they are advertising bright green post and go machins with the Philakorea overprint. Must be a poor copy of the darker versions surely !! Don't take any notice of Royal Mail images, especially before they are issued. The stamps in the Pseudo-NCR pack were also tinted green. One year they used the designs for the Europe country stamp for the new value World stamps. Attended venue 28/07/2014. Firstly, the Post & Go Machine is NOT situated in the Museum Shop. It is actually in the 'Babcock Galleries' which is part of the Museum itself which you need a ticket for and were initially challenged for. However, having spoken to staff and the ticket office at the main gate to the Dockyard, access to use the Post & Go Machine is now FREE. Although the machine looks like it is in the shop, This is in actual fact within the museum itself and is not classified as being part of the main shop by the staff.